This is the story of Spalding Gray and his attempt to write a novel. It is a first person account about writing and living, and dealing with success while trying to be successful. 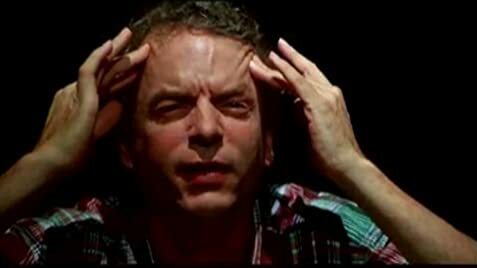 In this comedic monologue, Spalding Gray talks about impulse-buying an old cabin in the woods and the various, constant upkeep required. Spalding Gray calls his version of performance art a "talking cure." 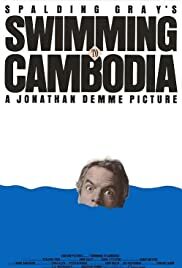 The facts, opinions, insights, fears and hopes drawn from the epiphany he received from his experiences in the Asian Rim shooting "The Killing Fields" and his education of the plight of the Cambodian people circa early to mid seventies is overwhelming. This is a story of the human condition as told by a master. He is Dr. Frankenstein creating the monster that is ourselves through a tapestry of wordplay that never seems overwrought or cumbersome in the slightest. This movie is one man reading from a standard notebook, behind a plain table accented with a glass of water and shadowed by a ceiling fan and selection of maps. Demme's use of lighting and Laurie Anderson's soundtrack provide all the dramatic power needed to sustain Gray as he literally helps us all better understand life, humanity and our responsibilities to each other while we spend time on this planet. Intense, funny, heartbreaking and invigorating; this movie inspires and changes all who watch it.